I have a movie recommendation for all of my blog reader(s). 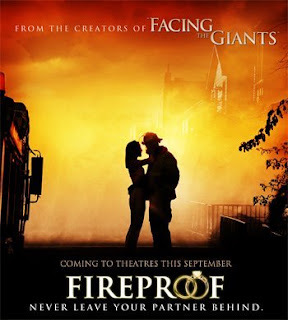 It's an amazing movie called Fireproof. For those of us who grew up in the 80s, we'll be quick to recognize the main star of the movie as "Mike Seaver" a.k.a. Kirk Cameron from Growing Pains. Now I wasn't quite as smitten with him as one of my sisters was, but I've definitely seen him as a talented actor (have you seen the Left Behind movies?). Fireproof is no exception. Kirk Cameron leads a cast essentially compiled of volunteers -- you won't find any other "big name" stars in this movie. But what you will find is a touching story about a firefighter who is struggling to keep his marriage in tact. Although he and his wife were in love when they first married, they gradually grew apart over the years. Their story could have very well been written about probably 70+% of married couples in our great country (Note: this isn't an actual statistic--I'm just making a guesstimate here). Anyway, this movie is all about a 40-day commitment Cameron's character makes to save his marriage. Hubs and I will be celebrating our 3rd anniversary later this month. It's so exciting and yet it's unbelievable because it feels like we've been married much longer than 3 years! And I'll admit the "warm and fuzzy" feelings we had in the beginning as our love grew and began to flourish aren't as prevalent these days. We're busy, we're raising a family, we're living our lives. BUT the commitment we made to each other in November 2005 is just as strong (if not more so) today than it was then. Do we always, constantly, 110% of the time feel that love? I'll be honest and say "no"--simply because love is so much more than a feeling. With God as the center and stronghold of our marriage, we have no doubt that we will see our commitment through until eternity! Sorry to get so "mushy" on you guys... I guess this movie just really hit a spot with me because I am so passionate about marriage and the commitment of one man and one woman to love each other for a lifetime. That being said, please go see this movie. Please support the makers of this film who are Christians and are making a movie available in the mainstream that doesn't involve the language, sexuality, violence or other bad stuff that our society seems to soak up. Support this movie and send the message that we are ready and waiting for more wholesome, family-oriented films from Hollywood!